Take the salon home and indulge in a rich, buttery hair masque made for dry, damaged and over-processed hair. Packed with professional-strength ingredients to soften, smooth and add shine, hair is left strengthened, hydrated and repaired. Radish Root Extract, high in Vitamins A, C and K contributes to healthier-looking hair. Our perfect blend of Argan, Avocado and Marula Oils, alongside naturally-derived Pea Protein, reinforce weak areas and improve elasticity to prevent future breakage. 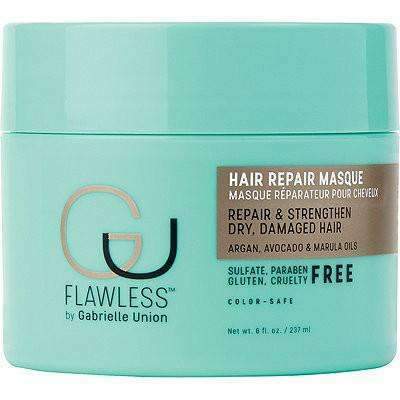 Repairs dry, damaged hair Softens, smooths and hydrates to support stronger, healthier hair Strengthens hair elasticity to help prevent future breakage All Flawless by Gabrielle products are free from sulfates, parabens or gluten. Safe for color-treated hair; relaxed hair, weaves, wigs, and human hair extensions. Cruelty-free and ethically sourced ingredients. Key Ingredients Argan Oil - Improves hair strength, repairs damage and restores shine and softness Marula Oil - Highly concentrated with essential fatty acids, antioxidants and omegas Avocado Oil - Strengthens hair against breakage and binds split ends together Silicone Derivative - An alternative to silicones for a silky, elegant after-feel Emollient - Provides enhanced conditioning and shine Pea Protein - Delivers essential amino acids for increased hydration and elasticity How To Use Apply to hair and cover hair with a plastic cap or warm, damp towel and apply heat for 10-15 minutes to allow the masque to penetrate deeper into your hair! Ingredients Water(Aqua), Cetearyl Alcohol, Glycerin, Cetyl Palmitate, Behentrimonium Chloride, Cetrimonium Chloride, Dimethicone, Fragrance (Parfum), Sclerocarya Birrea (Marula) Seed Oil, Persea Gratissima (Avocado) Oil, Argania Spinosa (Argan) Kernel Oil, Hydrogenated Castor Oil/Sebacic Acid Copolymer, Hydrolyzed Pea Protein, Raphanus Sativus (Radish) Root Extract, Amodimethicone, Isopropyl Alcohol, Polyquaternium-37, Sodium PCA, Bis-Cetearyl Amodimethicone, Polyester-11, Propylene Glycol Dicaprylate/Dicaprate, Trideceth-12, PPG-1 Trideceth-6, Aminomethyl Propanol, C10-11 Isoparaffin, Acrylates/Stearyl Methacrylate Copolymer, Sorbitan Oleate, Benzoic Acid, Butylene Glycol, Benzethonium Chloride, Sorbic Acid, Citric Acid, Phenoxyethanol, Chlorphenesin, Hexyl Cinnamal.